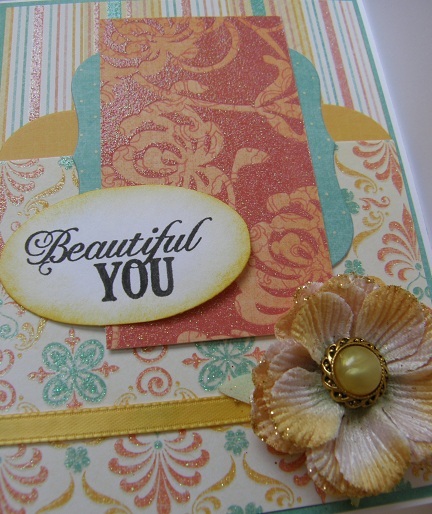 First up is "Beautiful You" using Teresa's sketch. 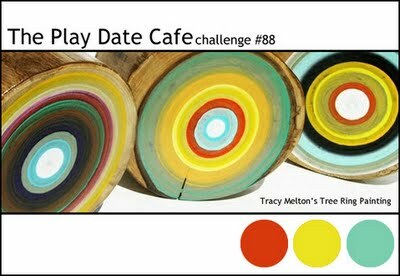 I also made this first card to enter The Play Date Cafe's challenge, PDCC88. This is my first time playing along with their color challenge. 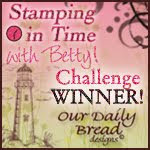 I used a sentiment from Verve's "Beautiful You" stamped in Versafine Onyx Black ink. The dps are all from DCWV, "The Sorbet Stack." I think they match the inspiration colors pretty closely. 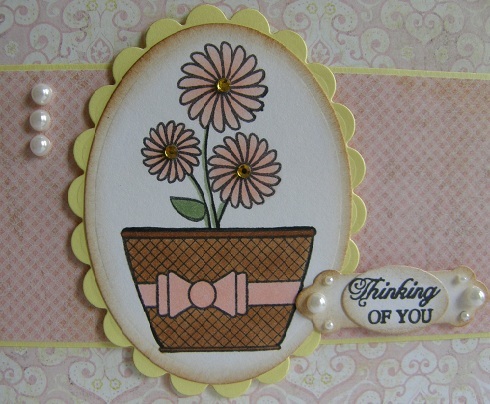 Other things: Nesties, MFT scallop border die, Prima glittery flower, ribbon from stash, SU! "Daffodil Delight" ink for sponged edge. This card is a standard A2 size. You can see the glittery papers a little better on this picture. 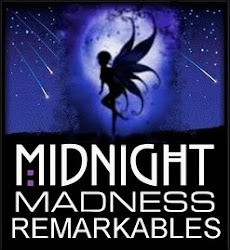 It is really sparkly in real life! Second up is "Thinking of You" using Amber's sketch. Here's my card. It is 6" square, but it sure doesn't look square in this photo, does it?! 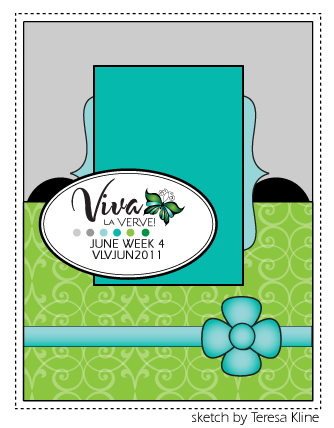 I used two different Verve sets, "Chicks Rule" for the basket and flowers and "Artful Elegance" for the sentiment. I cut out the sentiment using some of the Verve "A Cut Above" dies. The sentiment is stamped in Versafine Onyx Black. 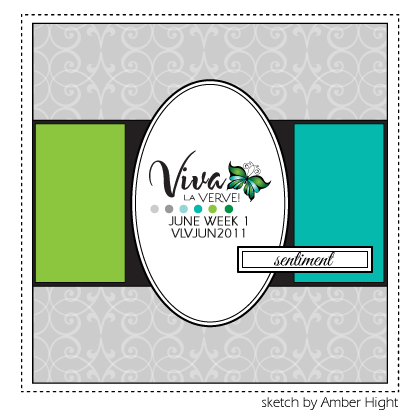 I stamped the images in Memento Tuxedo Black and colored using Copics ROO, R20, E35, E37, and YG63. 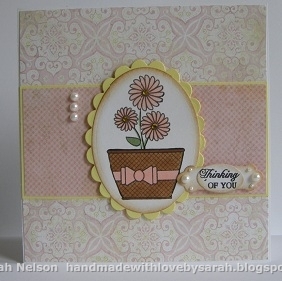 I added some Vintage Photo Distress Ink to the edges as well as some pearls and some gems to the flower centers. The dps are Basic Grey, older collections, not sure just which ones as these were scraps that were just loose in the pile. 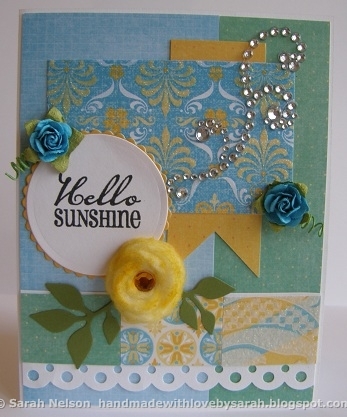 Finally is "Hello Sunshine" using Sankari's sketch. 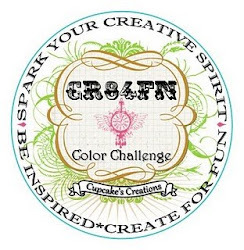 I had intended to enter this one in the CR84FN32 color challenge, but alas, I am too late in posting! 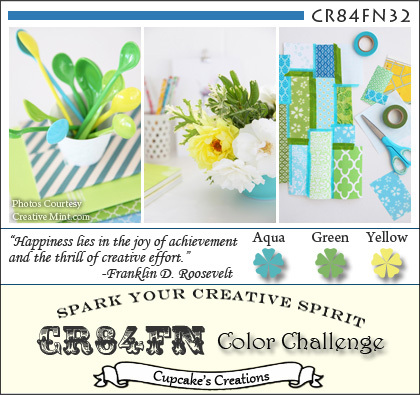 Here's my very bright card! Sentiment from Verve's "Let It Shine"
DPs: DCWV "The Sorbet Stack"
Other: MS punch, Nesties, Recollections flowers and rhinestones, Sizzix die, rolled rose made from a scrap of quilt batting and sponged with SU! "Daffodil Delight" ink, gold rhinestone. 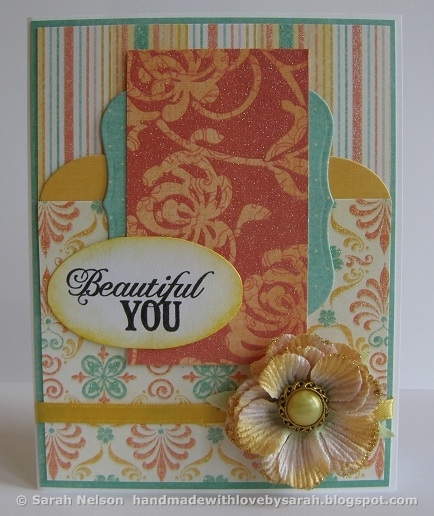 So glad you could joing us at The Play Date Cafe:) You totally nailed the colour story in this beautiful card!!! 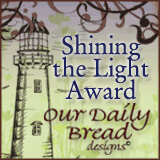 You have been a busy crafter! 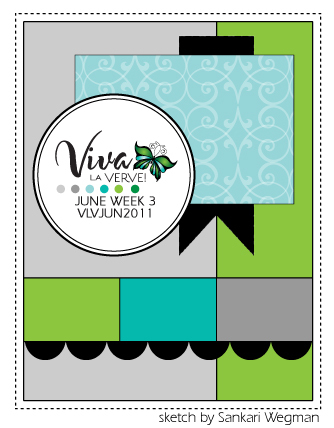 Love how you pulled together all those perfect patterned papers for our color challenge this week. THanks for playing at THe Cafe with us! 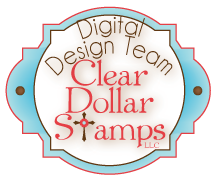 Such pretty inspiration here - I LOVE all of those sparkly papers you have combined for your PDCC card. Soooo glad you found us and gave us a go. 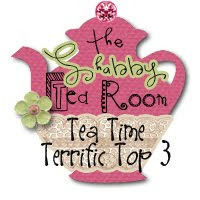 Thanks for playing along at The Play Date Cafe.